Eriez Magnetics Europe Ltd have announced their presence at Powtech in the Exhibition Centre Nuremberg, Germany from 23-25th April 2013 in hall 4, stand 421. Eriez’ experienced technical team will be on hand to discuss how Eriez Magnetic Separators, Metal Detectors and Vibratory equipment can help enhance and develop existing and new process lines in many industries including chemical, pharmaceutical, food, plastics and many more. 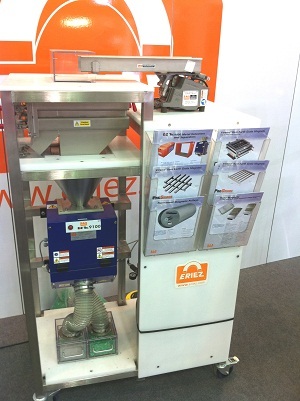 Showcased on the Eriez booth will be various Magnetic Separators from the high quality ProGrade™ range. This includes Magnetic Grates, Bullet Magnets, Tube Magnets and Magnetic Traps which are used to remove ferrous contamination from free flowing materials. Eriez realises that replacing or adding new components to a process line means downtime for the customer. With this in mind, Eriez have made the entire ProGrade™ range available for immediate dispatch. To complement the ProGrade range, Eriez will also showcase the E-Z Tec 9100 Metal Detector which is a high sensitivity unit designed for detecting all types of metal in free fall and automatically diverting them from the product flow. Eriez will be running live demonstrations throughout the duration of the show on a total Metal Separation unit which will incorporate a Vibratory Feeder, feeding a ProGrade Easy to Clean Grate in Housing to remove any ferrous contamination, and then gravity fed through an E-Z Tec 9100 Metal Detector to remove any remaining metal contamination. Customers are invited to bring their own samples to the Eriez booth to run over the unit to see what separation levels can be achieved.